Asthma is a chronic disease of the respiratory system in which the airway sometimes constricts and becomes inflamed. Also, the respiratory lining produces excessive amounts of thick mucus, often in response to one or more triggers. This mechanism is responsible for symptoms such as wheezing, shortness of breath, chest tightness, and coughing. What triggers these asthma attacks? Well, the answer to this question is not easy to give. Theoretically, there are many possible triggers, and yet every person reacts individually, so, there are simply no rules. Attacks may be triggered by such things as exposure to an environmental stimulant, cold air, warm air, moist air, exercise or exertion, or emotional stress. Fortunately, all these symptoms of asthma, which can range from mild to life-threatening, can usually be controlled with a combination of drugs and environmental changes. Of course, the most effective way of control is avoiding the triggers. While in some individuals asthma is characterized by chronic respiratory impairment, in others it is an intermittent illness marked by episodic incidents. It is an extremely widely spread disease. Approximately 14 million adults and 6 million children in the U.S. have asthma. An acute exacerbation of asthma is medically known as asthma attack. These attacks can be mild, symptomatic, asymptomatic, or severe. As we’ve said earlier, sometimes asthma attacks can be extremely serious. During these kinds of attacks the accessory muscles of respiration, especially sternocleidomastoid and scalene muscles of the neck may be cramped. A number of asthmatic claim to be able to predict when an attack will happen because they experience something they call the “asthmatic aura”. Just before loss of consciousness, sometimes a patient will feel numbness in the limbs, and palms may start to sweat. Feet may become icy cold. What exactly triggers asthma? As previously mentioned, every person has their own triggers. These are different types of substances that can be found all around us. If your asthma is triggered by allergens, simply avoiding them would be a much better plan then to use tons of medications to treat your symptoms. Asthmatic lungs aren’t as healthy as those of other people. This is why inflamed asthmatic airways are hyper-sensitive to environmental irritants. Also, in rare cases, even simple changing weather conditions, such as changes in temperature and humidity, barometric pressure or strong winds can cause severe asthma attacks. This is important because such irritants can hardly be avoided. Some viral infections such as colds or viral pneumonia can trigger or aggravate asthma, especially in young children. Initially, experts were not sure about this claim, but after several studies done on this matter, it is now considered a proven fact. Sometimes strenuous physical exercise can also trigger attacks. 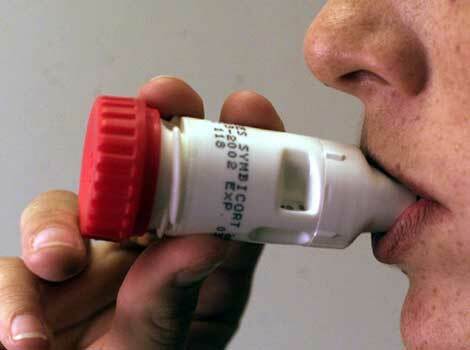 Certain types of medication can cause asthma attacks in some patients. Some of the most common asthma trigger medications include Aspirin (or other NSAIDS such as ibuprofen®) and beta-blockers. Aslo, certain types of food or food additives can trigger asthma symptoms. Some of the most common asthma triggers are milk, eggs, peanuts, tree nuts, soy, wheat, fish, and shellfish. For a long time experts thought that asthma was in fact a psychological disorder, since it was known to happen to people under stress. Now, it has been proven not to be an emotional disorder, although emotions can trigger it. Anxiety and nervous stress probably cause fatigue, which may also increase asthma symptoms and aggravate an attack. having breathing troubles. diagnosed with a stomach ulcer.